Maurizio is the full Accoyo son of 2Peruvian Bruxo (Accoyo) and 2Peruvian Eleuteria (Accoyo) who is medium fawn in color. Maurizio carries the gentle nature of his sire Bruxo, along with strong, heavy boned body type. Maurizio's fleece has narrow, high luster locks with that desirable "greasy" appearance. He has outstanding leg coverage, a heavy dense fleece, and still sports facial coverage and a beard at the age of 5. Accoyo Bruxo has produced many show-winning offspring, and there is great expectation for Maurizio producing colored Accoyos with show-winning records. He has dark, light, and multi crias on the ground, allowing color to pass through. He has produced light fawn, beige, and white colors out of solid white females. Maurizio has produced a long line of show winners for both halter and fleece. Check out the winnings of his sons Accoyo Allegiance and Accoyo Apocalypse on AlpacaNation - WOW! His daughter Accoyo Caress also won Reserve Color Champion - Yearling Whites at the Suri Symposium All Suri Fleece Show in August 2006 - the largest suri fleece show in the world! His daughter Accoyo Amoretta, won Color Champion - Multi Suri Fleece at the same show. What a showing for Maurizio! 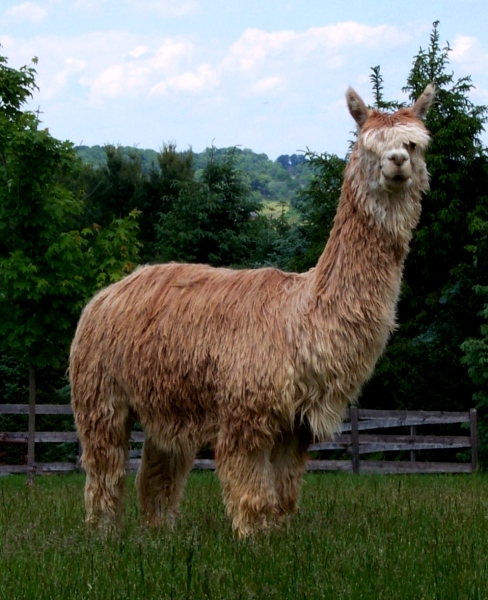 Maurizio was co-owned with Page and Craig Nitterhouse of Shasta Springs Alpacas. Passion is the daughter of Accoyo Baccarat (beige) and Accoyo Tafetan (fawn), showing very high luster and great density. $4,000 Full Accoyo Lt Fawn! Her sire, Maurizio is the full Accoyo son of 2Peruvian Bruxo (Accoyo) and 2Peruvian Eleuteria (Accoyo) who is medium fawn in color. Maurizio carries the gentle nature of his sire Bruxo, along with strong, heavy boned body type. Maurizio's fleece has narrow, high luster locks with that desirable "greasy" appearance. He has outstanding leg coverage, a heavy dense fleece, and still sports facial coverage and a beard at the age of 5. Accoyo Bruxo has produced many multi-champion show-winning offspring. He has dark, light, and multi crias on the ground, allowing color to pass through. He has produced light fawn, beige, and white colors out of solid white females. Charity's dam, Passion, is an Accoyo Baccarat daughter, which is rare in in the Accoyo bloodlines, and the daughter of Tafetan de Vainille (Accoyo), a light fawn 4Peruvian import. 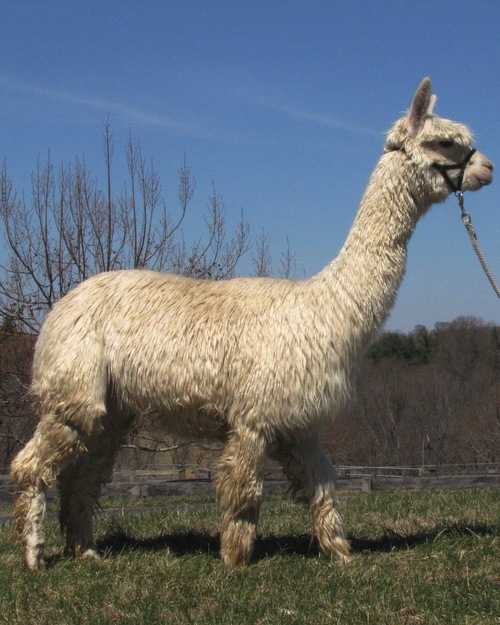 Her bloodlines make it possible to breed her to any of the popular Accoyo bloodlines that have been greatly used without the worry of line breeding or inbreeding. 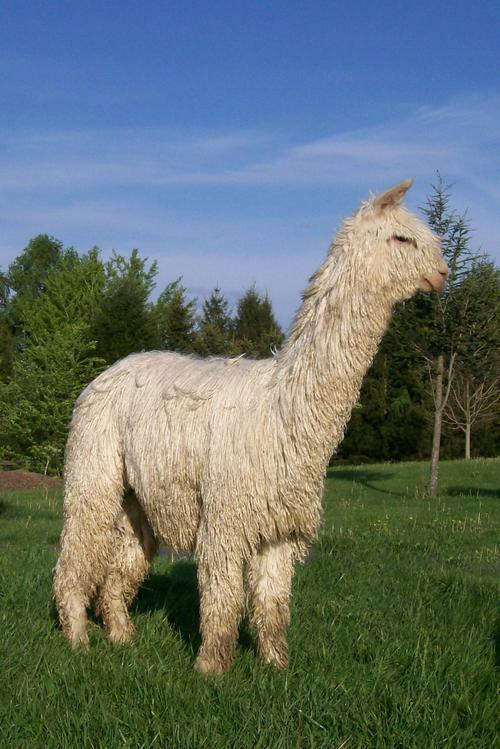 Passion still has a beautiful slick, high luster fleece, and routinely shears 7 lbs per year. 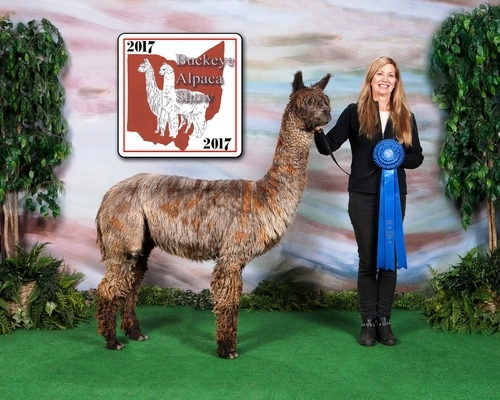 Her 1st daughter, WRSR Accoyo Charity, has won 2 AOBA and 1 AFCNA National Championships, and she also has produced a 2010 Reserve Champion (Halter) with her first cria, WRSR Accoyo Omega. Charity's show winnings are impressive! She produces very high quality fiber and so do her crias. Her first cria is the beige WRSR Accoyo Omega by Luna's Accoyo Bruno, brother to Accoyo Rockstar. Omega won Reserve Champion Light Suris at the 2009 MABA Alpaca Celebration, and 4th (11 in class) at the 2009 AOBA National Show in Cleveland, OH as a juvenile. 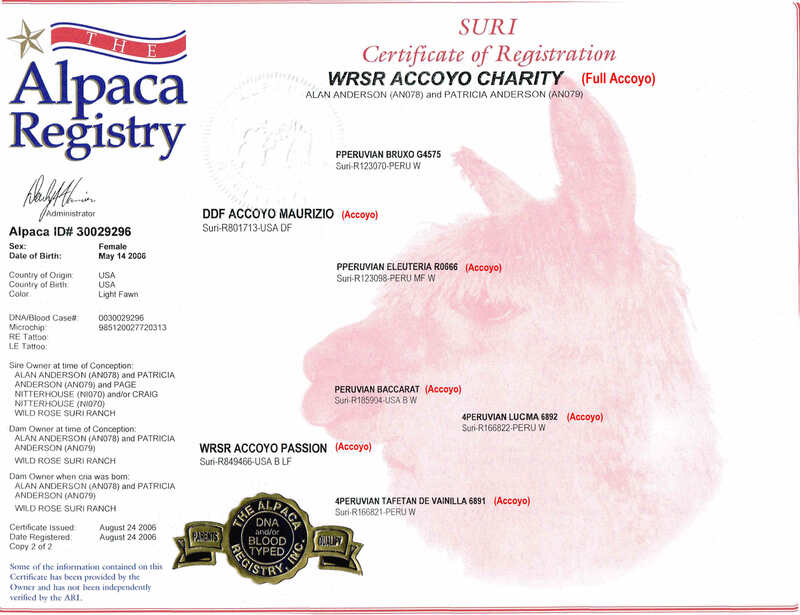 Her 2010 cria is a light fawn full Accoyo male by MFI Torbio's Masterpiece, "WRSR Accoyo Van Gogh". Charity continues to produce beautiful crias with consistently fine fleeces and will remain a top foundation dam. Charity is currently and we recommend her to be bred to Fusion, our appaloosa grey/fawn male with large spots. Fusion produces appies from fawn females, so we are expecting a beautiful 1/2 Accoyo appy cria. Charity is a great mom with plenty of milk. Fusion breedings to outside dams are now closed. 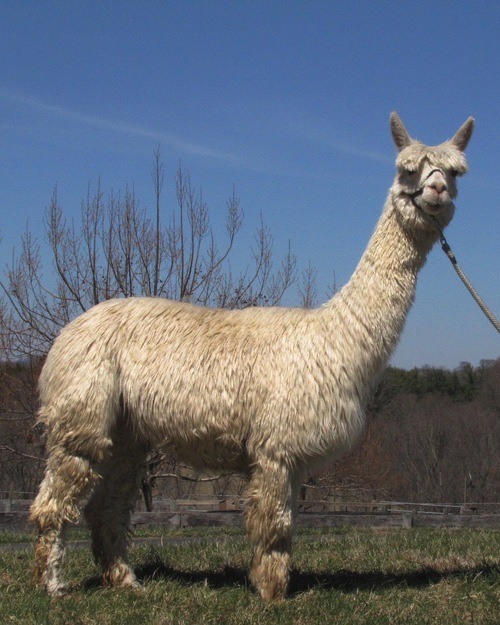 Get a beautiful appy cria and a wonderfully dense production dam! Call Patti at 443-740-4240 for more information.